First Wednesday in March, July 5, Sept. 9, Nov. 16; also in March, and Nov. 16, for hiring. This place is situated in the midst of very beautiful mountain scenery, has a population of 5,235, returning one member to parliament. It is 20 miles from Abergavenny, and communicable by coach every day. 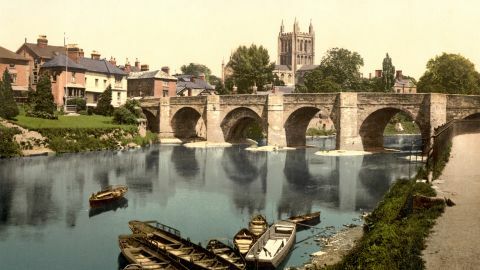 The principal buildings consist of three churches, County Hall, and Market House, very handsome, new Assize Courts, built in 1843, Barracks, Theatre, Infirmary, a bridge of seven arches over the Usk, from which is a fine view; there are also an Independent Training College and Grammar School, at which Jones, the comity historian, was educated. Here are the remains of an old castle, consisting of the “Ely Tower,” so called from Dr. Mortan, Bishop of Ely, who was a prisoner at the instance of Richard III., and as the scene of the conference between the Bishop and the Duke of Buckingham. Newmarch, a Norman baron, was the founder of this castle. Hugh Price, the founder of Jesus College, at Oxford, was born here; and Shakspeare’s Fluellen, or Sir David Gow lived in the neighbourhood. He was knighted at Agincourt by Henry V., when at the point of death, having sacrificed his own life to save the king’s. Another native of Brecon was Mrs. Siddons. The “Shoulder of Mutton” Inn is pointed out as the place of her nativity. 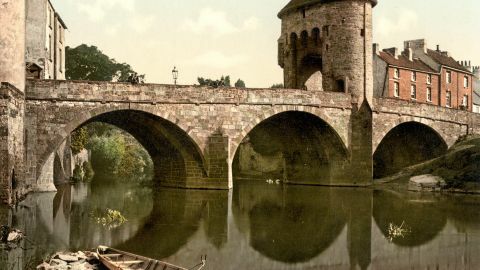 It stands in a romantic part of the Usk, by the banks of which beautiful walks are laid out. 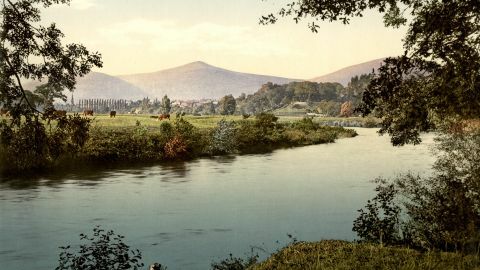 The Usk is a line trout stream; and the valley through which it flows westward, remarkable for its beautiful scenery. Making the descent of the Usk, you come to Crickhowell, where there is good angling, and (what is rare in the county), a spire church. The Hatteril, or Cradle Mountains lie to the east, the highest of which, Pen-y-Cader-fawr, is about 2,545 feet high.